Providing professional lawn cutting services. Cutting starts at $33.00 per week. 28 years experience, licensed & insured. 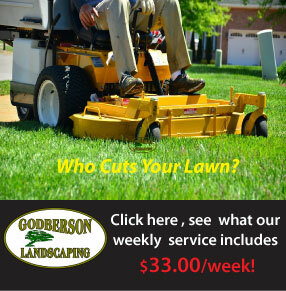 Is Your Landscaper Scalping you Lawn & Wallet? Is It Time To Renovate Your Lawn? The parent company of Suffolk Sod Father, Godberson Landscaping proudly serves our Long Island neighbors with lawn maintenance services since 1991. That's over 20 years of lawn maintenance, landscape design and masonry experience...top notch, affordable landscape solutions delivered to our valued Long Island customers. Let us tailor a lawn maintenance package for you or create a hardscaping design that will enhance the beauty and function of your property! sod services visit Suffolk Sod Father. If you have any questions about our services please contact Kevin. With a professionally installed sod lawn you ensure a healthy lush green lawn for years. Put the experience of Suffolk Sod Father to work for you .From sod installaition to lawn maintenance the Suffolk Sod Father delivers. We love our customers and appreciate your loyalty! Refer your friends/neighbors & receive a $50.00 credit towards your next bill. Receive a $100.00 credit for a sod installation referral. Credits apply after services have been completed.